Noh theater is one of the arts that best reflect the essence of Japanese culture. This article introduces three tips on how to enjoy a Noh play along with examples and information on a Noh performance in Tokyo with English guidance. Noh theater is a Japanese art combining music, dance, chant, masked acting, and beyond them all, a cultural memory shared by the performers and the audience, which allows for details of the story to be left unsaid, only alluded to. Watching a Noh performance is the best way to experience the world of Noh, an art that has been loved by Japanese audiences for over six centuries. On March 29, 2019, there will be a Noh performance for visitors to Japan at the Yarai Noh Theater in Tokyo. With the help of an application called Noh Support, the audience will be able to follow the Noh play in English. Here are some tips on how to make the most of watching Noh, one of the arts that best represents the essence of Japanese culture. What makes Noh so fascinating is the old stories it draws inspiration from. Most of the stories behind Noh plays come from a distant, magical past. These plays often feature deities or ghosts appearing in the dreams of those who come to a certain place to search for remnants of the past. There are two types of Noh plays - mugen Noh ("dream Noh") and genzai Noh ("present-day Noh"). In mugen Noh, there is a character that dreams of the story unfolding on the stage, and the audience witnesses their dream. In genzai Noh, the events on stage unfold as if they were happening in reality. For example, in one dream Noh play called Izutsu ("The Water Well"), the ghost of a woman who had been the wife of the poet Ariwara no Narihira (825 - 880) comes at the water-well near the grave of her husband and remembers the time they spent together. As she looks into the well, instead of her own reflection she sees the face of the one she dearly misses. In the Noh play Yashima, the ghost of the famous warrior Minamoto no Yoshitsune (1159 - 1189) himself comes before the audience to tell of the fierce battles during the Genpei war (1180-1185), which decided the course of Japanese history. Because he lived his life as a warrior, he is damned to spend the rest of eternity in the hell of the ashura (war gods), where the fighting never stops. By the end of the play, you don’t know anymore whether the scenes of war he described were of the battles between demons in hell, or of the cosmic battle between night and day. The two plays introduced above are both of the dream Noh type. A famous genzai Noh (present-day Noh) is Sumidagawa ("Sumida River"). It is the story of a woman wandering the country in search of her child, who had been kidnapped. Her heart breaks with sorrow when she finds the child’s grave on the bank of Sumida River. She would do anything to see him again. In her distress, she has a vision of him coming out of the grave to embrace her. But he is no longer in this world and all she can do is pray for his soul. These are all stories that have been performed for centuries, embodying the dreams of those who enjoyed them. Nowadays, even just by reading these plays, we cannot help becoming enraptured by the refined feelings that underlie them. You can read excellent synopses of Noh plays in English on The Noh.com, a site dedicated to introducing non-Japanese audiences to the world of Noh. Another way of getting closer to the world of Noh is by taking a look at the writings left by actors, such as Zeami (1363-1443). Written about six centuries ago, treatises like Fushikaden (translated in English by Rimer J.Y. and Yamazaki M. as "On The Art Of No Drama - The Major Treatises Of Zeami") have been handed down through generations of performers until nowadays, when they are available in various languages. Fushikaden contains a theory on acting that is impressive in its consistency taking into account that the art of Noh was only at its beginnings in Zeami’s time. These writings are extremely detailed and practical, showing their author’s dedication to his art and the way he sought for the best technique to create and to hold the illusion on the stage. Only by watching a Noh play in a theater you can experience the tempo of the actor’s movement on stage and feel the chills at seeing the expression of the mask they are wearing. Noh masks are often labeled "expressionless", but at a closer look, you'll notice that even the slightest change of angle results in another facial expression. This is one of the fascinating aspects about Noh masks. The kimonos worn by Noh actors on stage are specially made for Noh. They are usually lavishly decorated with patterns that have some connection with the story. For example, when playing "Lady Aoi", Noh actors will often wear kimonos with wheel patterns embroidered on them. That's because the "wheel of destiny" is a word that often comes up in this play. The Noh stage itself has a special structure, being connected to the backstage through a bridge called hashigakari. This bridge symbolizes the path between our world and the other world which is inhabited by deities and the souls of the departed. You'll notice that there are no or very few props used in Noh. All the details about location and time (such as scenery or season and weather) are conveyed through the words of the characters and the audience has to imagine the scenery. The music of Noh consists in the sound of the flute and the rhythm of the drums. It is a music that hints at the fact that you are witnessing an apparition from another world. All these details contribute to creating the solemn atmosphere specific to Noh. The quiet elegance of Noh has won the hearts of audiences for generations. If you would like to get closer to the depths of Japanese culture, watching a Noh play is highly recommended. Watch a Noh Play with Explanations in English! A FLOWER is a project dedicated to introducing Noh theater to international visitors to Japan. It will be held on March 29, 2019, at the Yarai Noh Theater in Tokyo. The audience will be able to follow the performance with the help of Noh Support, an application that offers the translation of the words in English, French and Chinese. Arrive at the venue a little earlier and you can take photos of and together with the performers (17:45 - 18:30). Moreover, you can enjoy Japanese sake and snacks, and even purchase Noh-related souvenirs. All the members of the audience will receive commemorative photos of the Noh performance as a gift. If you would like to watch this performance, reserve your tickets using one of the links below and you'll receive an exclusive MATCHA reader discount! 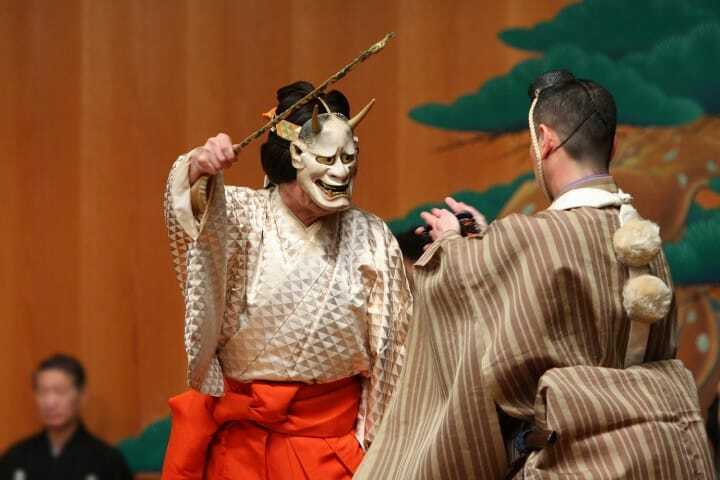 Noh theater is a great way to take a step deeper into understanding Japanese culture. We hope you enjoy it!